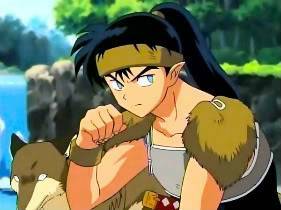 Bio: Koga is the young leader of the southern Wolf-Demon tribe, which is nearly wiped out by Kagura and Naraku. He first meets InuYasha as an opponent in battle, but becomes a reluctant, occasional ally despite maintaining a strong sense of rivalry with the "useless mutt" about their relative combat strengths as well as Koga's persistent courtship of Kagome. After suffering serious wounds, Koga is partially restored by three Shikon shards embedded into his legs and right arm. The shards are eventually taken away from him by Naraku, gravely weakening him; he leaves and disappears from the manga, after telling Kagome that she may leave Inuyasha and come to him at any time.